With a solo exhibition, 1980s-born South Korean video artist Taeyoon Kim once again brings fascinating video works to Brisbane. 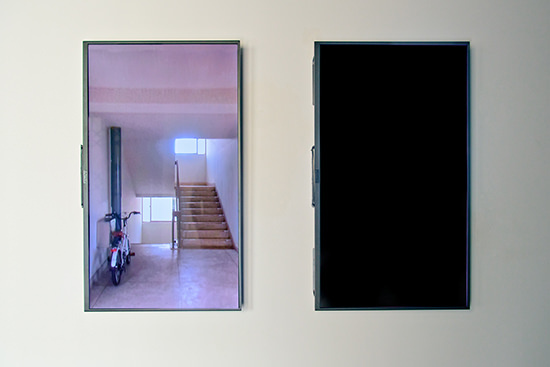 At the MAAP Space entrance is the two-screen work 1204, shot as if looking out from an elevator in an apartment building. One elevator per screen, each apparently moving in opposite directions. Unsynced. 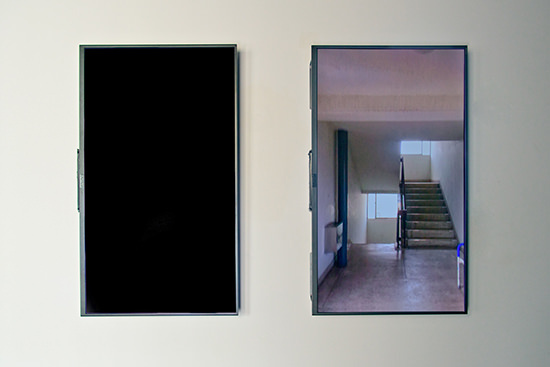 As the camera travels up and down we glimpse repeated sequences of stairwell landings and the blackness between floors. The landings seem to be places to leave bikes: kids’ bikes, bright plastic colours, solitary or clumped together. After a while one recognises that the landings seem to repeat but it is not obvious at all if the sequence of landings and floors is the same each time or even if the lift travel is real. Maybe Kim has saved every landing to a separate file and then accessed those files at random, interspersed with another file that looks like a ‘between floors’ shot. These landings are of a muchness anyway and does it really matter if the journey is real or just an impression of a possible journey? All that lift experience blurs into a generalised representation of ‘In the lift going up. Still in the lift, but going down.’ I doubt I’d even notice if the floor sequence I glimpsed in an unfamiliar building on the way up was the same as the one I saw on the way down. I’m still not sure if it is or isn’t in Kim’s video. I would have to investigate. The largest work is Steady Griffins, five screens scattered across floors and walls, wires trailing. 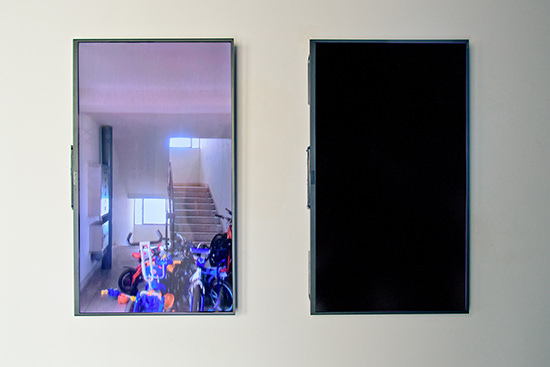 Each screen shows a soft and blurry fragment of an iPhone screen streaming Family Guy. Occasionally a generic ‘Play’ icon pops up. The video fragments were taken by placing another iPhone hard up against the first, so that each of the five screens of Steady Griffins is playing back just that tiny array of cartoon pixels that a phone camera lens can span. Change is slow and randomised, courtesy of some everything-is-a-database media scripting. Although without getting into the database and code we don’t know how those little Raspberry Pi computers are actually being used. The gentle pacing of the videos alludes to production methods in TV animation. In the old days (eg the Renaissance) a painter might be allocated costly pigments, like ultramarine, according to weight and volume. Higher beings commanded, ‘Paint my princely robes with that really expensive pigment and put shitloads of gold on them as well. Paint everyone else cheaper so they don’t look so important.’ Today digital colour is free, or at least all colours are equally specified, and there is as much of any colour as one can possibly want. The main input cost that can vary is labour, where so many hours at so many dollars/won/yen allows some specific number of unique drawings. As Family Guy is hand-drawn, most of the screen acts as a static backdrop to reduce labour hours and that budget move constrains significant action to a speaking mouth or blinking eyes and arms that flap rather than move realistically. And, as with the Renaissance, the important figure gets the money and every other character remains unnaturally still in the background. 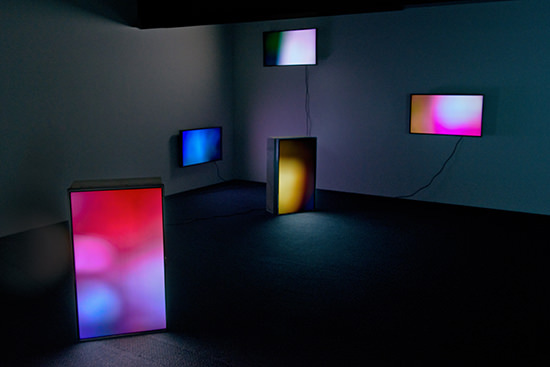 I’m reminded of Brian Eno’s early generative videos in the way the screens act as both image for the aesthetic gaze and as light source illuminating those who gaze upon it. A beautiful amalgam of lo-fi—just a phone camera and cheap Raspberry Pi media computers—and ultra tech: billions of dollars of research into materials science, quantum tunnelling, free operating systems, image compression algorithms and undreamt of optical technologies packaged into a phone camera and a computer on a stick. Hard-shop or buy them online. You don’t have to know how they work. A bit tucked away is Clear Away, a puzzling video of blurred and dirty particles hurtling across the screen. A conversation starts up in the gallery as we try to get a consensus on what the particles actually are. 1. Snow. Probably snow but the way the particles hurtle across the screen seems more blizzard-like, which would make standing out there problematic. And the video lasts seven minutes, by the end of which we can see the background is a sky gone from leaden cloud to patchy blue and the snow has dropped to nothing. Not that familiar with the possible time courses of blizzards, but doesn’t seem right. 2. Locusts. The whole effect of the particles is definitely one of swarming or streaming. I can see this as a window onto millions of hysterically frantic insects—except the particles are too blobby and varied in size. Plus, by the end the particles are falling more gently and a mass death of locusts mid-flight seems unlikely (although maybe they aren’t dead, maybe they are just exhausted and floating down to the ground below). 3. Dirt. Swirling in water. Sure, could be, but there doesn’t seem to be evidence of turbulence distorting the image. 4. Rain. Maybe, but there doesn’t seem to be any indication of high winds working the clouds with the sort of force that could drive the rain across the screen so quickly, and if there was a high enough wind then the raindrops would be the same size, much smaller, possibly breaking into high velocity white-out. I don’t resolve my thoughts about what we are seeing until I get home and look at the information sheet and see a clue there in the title: Clear Away. The video is perhaps the output of a snow blower or similar. The clearing of a path, cunningly portrayed through its effects and not its mechanism. Like Dashiell Hammett’s Continental Op detective, I’ve got my plausible story and that will do. Case closed. MAAP delivers, yet again, richly intriguing video from our timezone and to the north. Read MAAP’s newly appointed Korean researcher Seolhui Lee’s interview with Taeyoon Kim.